Experienced having too much cords on your table while working? I have and it's such a mess. It affects me so much that most of the times I can't work seeing them in a not-so-orderly condition. So what will you do if you're into this messy situation? 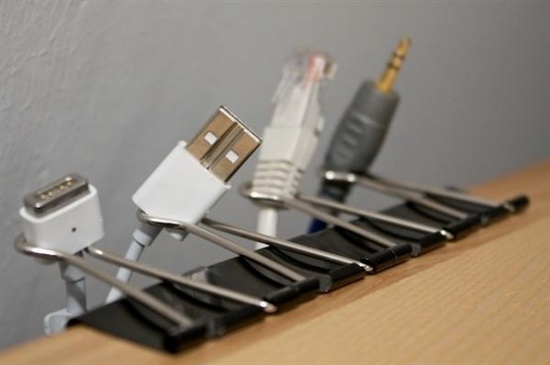 It's as simple as getting those big binder clips and clamping them on the table and voila you'll be able to hold your cords for phones, USB and other gadgets that you usually use while working. Keep them organized like the ones in picture above. No costs! Just be creative and you'll get an orderly and clear table in a flash. Got some tips for you - you can use colored binder clips for some style and colors.